Do like the Swedish do and share these buns and a coffee with a friend! 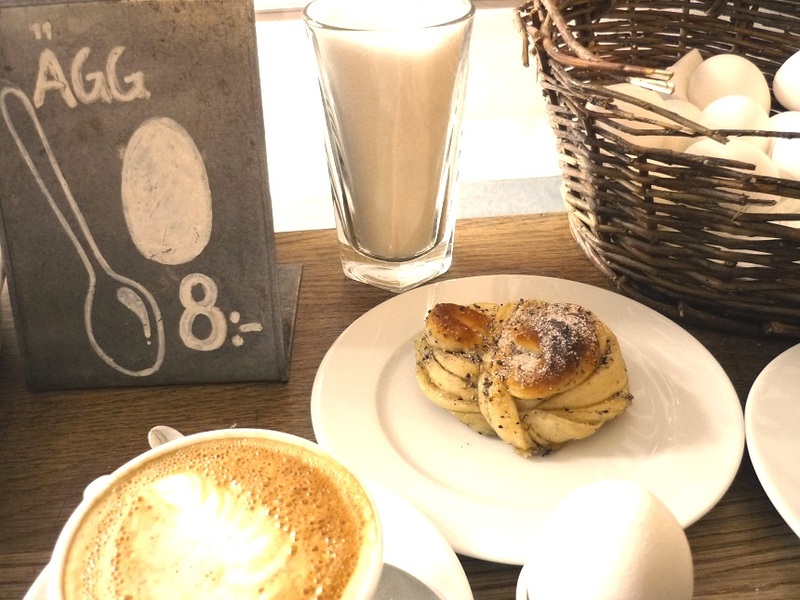 Having a coffee break with friends or family is a social institution in Sweden, known as fika, and pastries (in particular cinnamon and cardamom buns) are so much a part of it that they are often referred to as fikabröd, fika-bread. This recipe is based on the one by Linda Lomelino of the wonderful (and highly recommended) Swedish blog Call Me Cupcake, with some personal tweaks. Even if you have never used cardamom or fresh yeast in your baking before, it is really worth sticking to the Swedish recipe and giving it a try, as these are the two ingredients that give the buns their fragrant, aromatic flavour. Fresh yeast is easily available online, in most whole food shops or from real bakeries. In Britain, cardamom is more often associated with curries than with sweet pastries; cardamom pods are the big green pods in Pilau rice. For this recipe you will need the dark brown seeds inside the pods. Although supermarkets generally sells the green pods, rather than the seeds, the seeds are easily available online, including via Amazon. For this recipe, it is important to ground the seeds immediately before use, to keep their flavour and smell. 1. Before starting mixing the ingredients you will need to proof the fresh yeast. Heat 500 ml milk in a saucepan or in the microwave until it is approximately 37°C (98.5 F). The temperature is important: if the milk is hotter, the yeast will burn; if the milk is colder, the yeast will not activate (if you do not have a cooking thermometer you can use a medical one – just don’t tell anyone). When the milk is approximately 37°C, sprinkle 50 g fresh yeast (or 14 g of fast action dried yeast) and add 90 g granulated or brown sugar. Stir well until dissolved, then leave aside for 5 minutes. If the yeast is alive and active, it will release in the water and feed on the sugar. After a while, you should be able to see a bubbly foam forming on the surface, which is carbon dioxide being released (see photo 1). This is proof that the yeast is active. If after 5 minutes you cannot see any bubble, unfortunately your yeast is not working. You need to throw the milk solution away and start again. It is annoying, but it’s better starting again now than seeing your buns lying flat in the oven! 2. While waiting for the yeast to activate, mix 150 g soft butter, 2 teaspoons freshly ground cardamom and ½ teaspoon salt until smooth in a large bowl. After the yeast has activated, add the milk solution to the butter mixture. 3. Gradually add 840 g all purpose flour, then work until the dough is smooth and elastic. 4. Cover the bowl with a cloth and put in the oven, turned on at the minimum temperature. This is not to start the baking, but to help the dough rising. Leave to rise for about 45-60 minutes, until doubled in size. 5. Meanwhile, mix 175 g soft butter, 90 g granulated or brown sugar, 1 ½ tablespoons freshly ground cardamom, 1 tablespoon ground cinnamon and ½ teaspoon vanilla extract for the filling. Set aside. 6. When the dough is ready, roll it out into a large rectangle, about 40×50 cm. Spread the filling on top. 7. Fold the dough in half (you should have half of it layered on top of the other half). 8. Cut out long strips of dough (about 1-2 cm wide). 9. 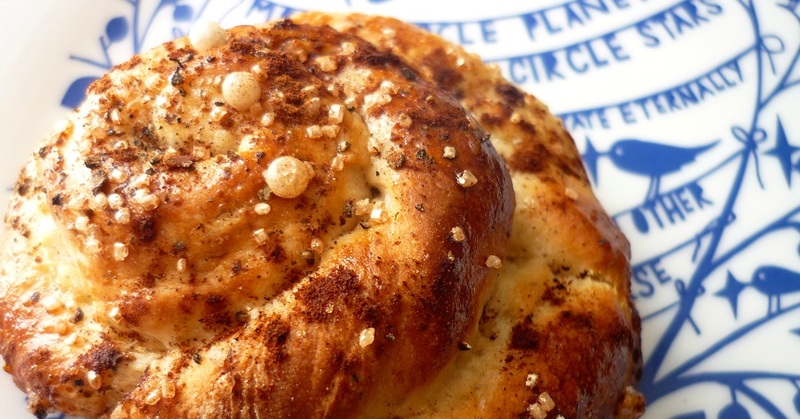 Properly spinning a cardamom bun into a knotty shape is an art: here is how the professionals do it. If you haven’t mastered the art yet, you can just twist each strip (as in photo 9a) and then roll it (as in photo 9b). 10. Put the buns on a baking tray covered with baking paper, cover with a clean cloth and leave to rise for 30 minutes. In the meantime, pre-heat the oven to 250°C (480F). 11. If you are not worried about egg allergies, brush the buns with a lightly beaten egg (the more egg you use, the browner the buns will be after baking). However, this is not an essential step – skipping it will make your buns egg-free. 12. Sprinkle the buns generously with pearl sugar, granulated sugar or chopped almonds and the remaining cardamom and cinnamon. Bake for about 8-11 minutes, depending on the size of the buns. 13. The buns are at their best when they are warm. Enjoy!